Hello friends, Terri here with a Crafty Adhesive Survival Kit. It’s perfect for gift giving to your crafty friends at a crop or weekend craft retreat. Let’s face it. There’s always someone who runs out or doesn’t bring enough adhesive, or, (heaven forbid) forgets their adhesive altogether! Be the one who comes to the rescue! Stick around for a few minutes, as I’ve got a process video for you as well. 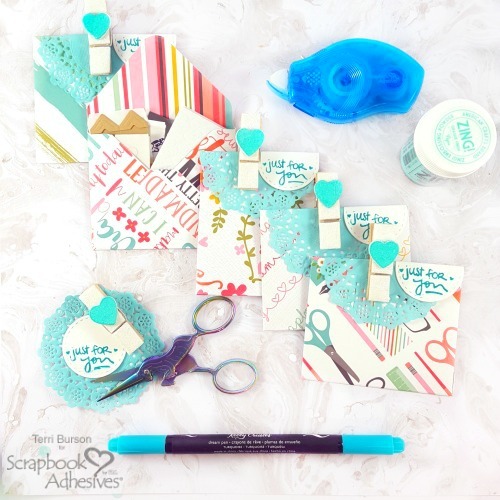 This crafty adhesive survival kit includes handmade envelopes stuffed with a variety of adhesives. 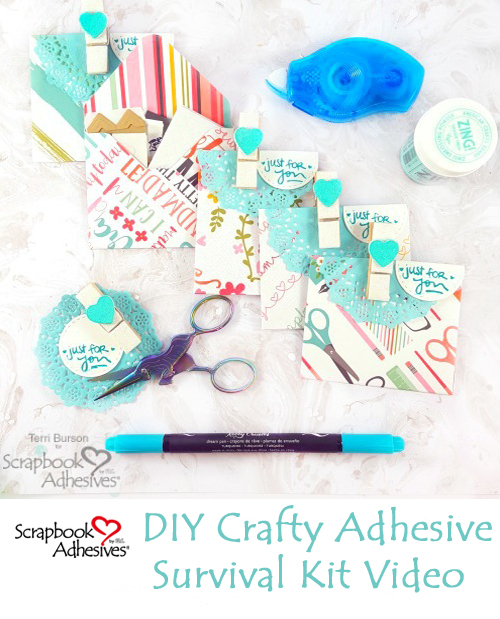 One of the key ingredients for this crafty adhesive survival kit is handmade envelopes. Let me introduce you to the E-Z Runner® Petite. This permanent dot mini dispenser is refillable and perfectly handy for planners and projects like this. 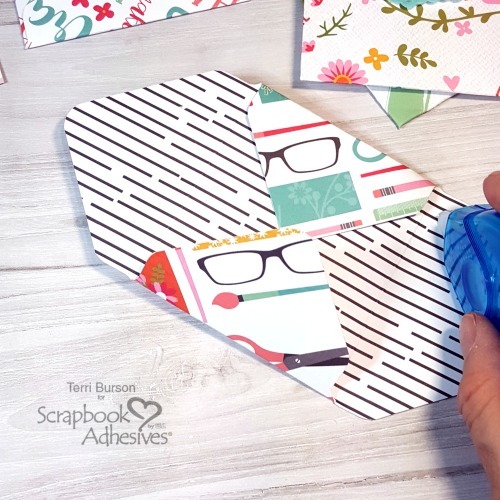 I love this dandy little adhesive runner! The portability and size is just right for me to keep in my desk at work. You know, for when I sneak in a little crafty time on break! 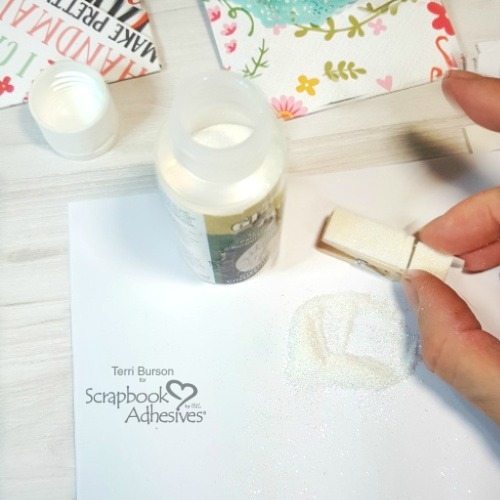 You’ll see exactly how to create these fun clips, burnishing the glitter and heat embossing the die cut hearts, for your own crafty adhesive survival kit. Check out my video! 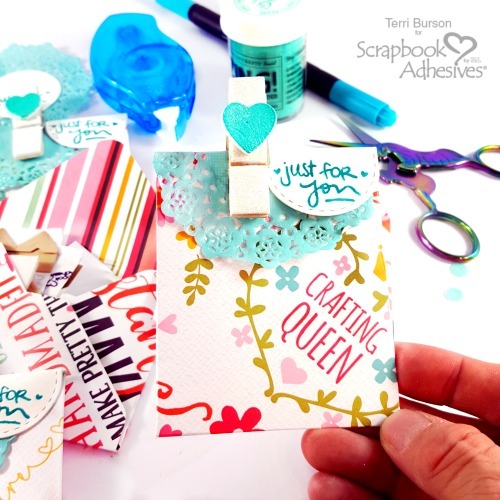 I’ll also show you how to make those handmade envelopes with a tool board. This entry was posted in 3D Foam Creative Sheets, Adhesives, Beginner, Crafts & Tutorials, E-Z Runner® Dispensers, Gifts, Permanent Adhesive, Skill Level, Tutorial, Wear your Adhesive on the Outside and tagged 3D Foam Creative Sheets White Medium, American Crafts, DecoArt, Doodlebug Design, E-Z Runner Petite Refillable Permanent Dots, E-Z Runner Petite Refills Permanent Dots, Lawn Fawn, My Sweet Petunia, Ranger Ink, Spellbinders Paper Arts, Strathmore, Terri Burson, Video Tutorial, We R Memory Keepers. Bookmark the permalink. ← Dimensional Valentine Card…with Love!